One’s a slasher, one’s a zombie flick, both titles sound like a total blast. So which party would I rather attend? 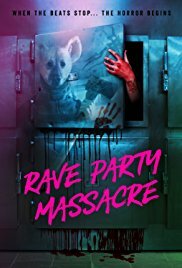 Running only 77 minutes long and centering on kids stalked by a masked killer with an axe at a rave in 1992, Rave Party Massacre could so easily be a nonstop slasher party. It’s visually crafted in classic slasher style with perfect horror atmosphere and tone. 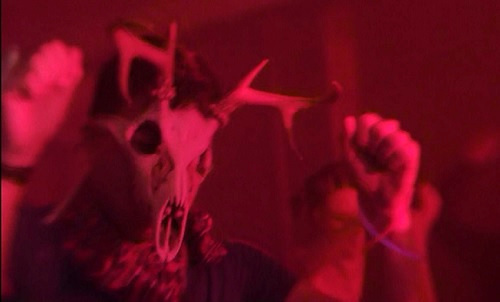 The rave scene alone is a fun throwback, complete with the spirit of the day—dancing, drugs, sexual desire, and even a gay couple slutting it up on the dance floor together to torment a horny girl. 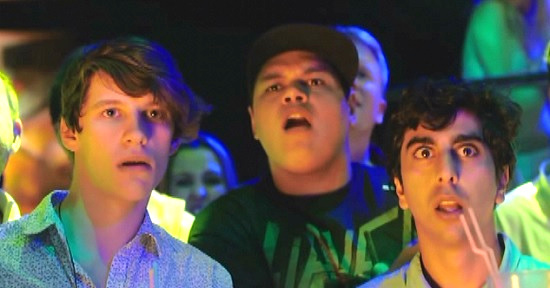 Oh how I wish these pretty boys had been a part of the full cast and not just a couple of extras. Problem is the film attempts to delve into a much bigger story than it needs to—or is capable of living up to. The underlying theme is politically charged, delving into conspiracy theories and the threat of the New World Order. It’s such a major undertaking to present in a simple slasher setting that the entire point has to be spelled out by a news reporter during a voice-over sequence after the closing credits begin. Why would a huge political plot lead a killer to stalk kids at a rave, you ask? Well, don’t. It would actually be easier to overlook the whole message of the movie and just enjoy it for the slasher elements. But even in that aspect, the kids spend the first 40 minutes of the movie freaking out as they try to get out of the hospital where the rave took place…before they’re even aware there’s a killer after them. Finally a masked guy with an axe shows up. Yet despite the kills being handled expertly, there’s more chasing in the film than death sequences, so in the end not even the slasher elements deliver…or live up to the title Rave Party Massacre. If only those gays had stuck around, they could have brought more life to the death party. The film was originally titled DeadThirsty…which would explain why the title was changed before release, because it also doesn’t live up to the original title! The film essentially paints itself into a corner. The zombie outbreak has begun, and a bunch of buddies decides to get away from it all by traveling to the exotic island…where the gay owner of the club has zombies shipped in to use as part of the attraction (the very first zombie attack is gay on gay!). So when our lovable, horny main boys go out to party, they get to witness everything from dancing zombies in cages to bodacious babes hacking zombies up on stage with a chainsaw. What could go wrong? The dance floor outbreak is awesomely crazy thanks to the flashes of colorful club lights. 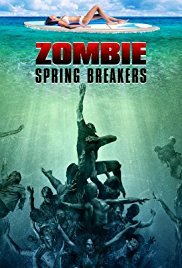 The zombie makeup is cool and there’s even an underwater zombie scene (but no shark). There are plenty of funny moments, including good old teen sexploitation humor, and the gay club owner gets the hots for one of the main guys. Plus, there’s a hottie with a body. There’s also a gnarly arm sawing scene that goes on forever! The only issue is that the action is a little slow for quite a while, and the film is almost an hour and forty minutes. Losing 10 to 15 minutes early on could have quickened the pace and really tightened up the fun flow. But I still had a good enough time with this one to add it to my movie collection. This entry was posted in Johnny You ARE Queer - Gay Thoughts, Movie Times & Television Schedules - Staying Entertained, Scared Silly - Horror Comedy, The Evil of the Thriller - Everything Horror and tagged gay horror, horror comedy, Ibiza Undead, living dead, Rave Party Massacre, slashers, undead, zombedy, Zombie Spring Breakers, zomcom. Bookmark the permalink.